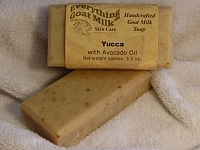 Yucca Goat Milk Soap incorporates the multitude of valuable skincare properties of yucca, an herb highly valued by Native Americans for issues such as psoriasis, eczema and dandruff. Real yucca root powder enhances the sudsing action of this fragrance-free soap, and creates beautiful reddish-brown speckles on a cream background. Ingredients: goat milk, olive oil, palm oil, coconut oil, sodium hydroxide (lye), avocado oil, castor oil, sea salt, yucca root powder. Net weight 3.5 oz.